Projects are becoming the heart of business. This comprehensive revision of the bestselling guide to project management explains the processes, practices, and management techniques you need to implement a successful project culture within your team and enterprise. Visualizing Project Management simplifies the challenge of managing complex projects with powerful, visual models that have been adopted by more than 100 leading government and private organizations. New, downloadable forms, templates, and worksheets make it easy to implement powerful project techniques and tools. 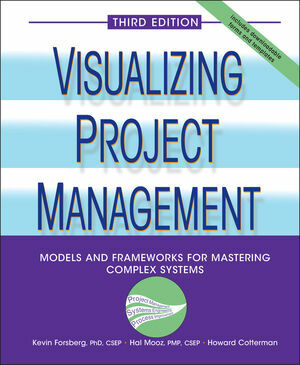 "I recommend this book to all those who aspire to project management [and] those who must supervise it." "The importance of this excellent book, able to encompass these two key disciplines [systems engineering and project management], cannot be overemphasized." KEVIN FORSBERG, PHD, CSEP, is cofounder of The Center for Systems Management, which provides project management and systems engineering services to an international client list that includes the CIA, Nokia, Lockheed Martin, and NASA. Dr. Forsberg has over forty-five years of experience in the project management and systems engineering fields and has won numerous awards, including the NASA Public Service Medal, the CIA Seal Medallion, and the INCOSE Pioneer Award. HAL MOOZ, PMP, CSEP, is cofounder of The Center for Systems Management and has twenty-three years of experience consulting to government and private organizations, including AT&T, NASA, Bell Labs, and GTE. He has developed leading university and industry project management training programs and trained more than 10,000 high-technology project managers. He was awarded the CIA Seal Medallion and the INCOSE Pioneer Award. HOWARD COTTERMAN has served The Center for Systems Management in roles ranging from project manager to president. His executive posts at leading technology companies include vice president of Rockwell International and engineering director responsible for Intel's family of microcomputers. • The Project Management Institute recommended Visualizing Project Management through its catalogue and promotes it through their website. • Previous editions have been adopted by major corporations including Lucent Technologies, the CIA, and Chiron (biotechnology) to help teach their project managers. The International Council on Systems Engineering (INCOSE) has recently launched a program to certify systems engineers in much the same way as the Project Management Institute certifies project managers to be PMP, Project Management Professionals.